The Durham Agricultural Society has a long and rich history within the town of Durham and surrounding communities. It was established in 1858 under the name South Grey Agricultural Society and by an act of Parliament, the Society's name was officially changed on April 26, 1934 to the current name of Durham Agricultural Society. Agricultural societies are Ontario's oldest organizations and were established before the Government. As settlers moved into the Grey and Bruce Counties, they established their homesteads and planted their crops. 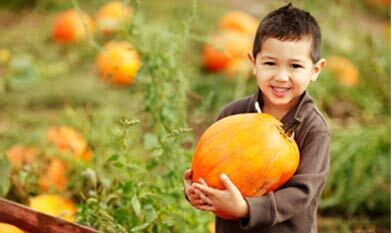 A highlight for them was the fall season when the men would gather to exhibit and display their year's produce and thus the Fall Fairs were born. Over the years, the Durham Fall Fair has been held in several locations throughout this town: at the old Drill Shed in Upper Town, on the face of the hill on Garafraxa Street which is now an entrance to the Saugeen Valley Conservation Park, in a building at the corner of Lambton and Garafraxa Streets and in Moody's barn near the foot of the hill. Near Moody's barn was an open field enclosed by a rail fence which was known as the Fair Grounds. The Fairs were next held on the east side of Bruce Street between Lambton and George Street West and finally in 1879, the Fair moved to the present location on Saddler Street West. The current arena is the third set of buildings to house the Fair. In 1890, the Society purchased the current property from the estate of the late Thomas Brown for a sum of $150.00. During the late 1800's the grounds were improved and more space was provided for the showing of horses. Further purchases of land included the hill and part of the flats. The "hill" provided a natural grandstand for the many visitors, overlooking the race track and flats below. At a later date, a covered and seated grandstand was erected at the foot of the hill opposite the starting point and finishing line of the race track. Later, hen houses and cattle sheds were erected, but stand no longer. In 1890, the addition of a half mile race track was built. In 1952, the members of the Durham Agricultural Society agreed to turn over their property to the town of Durham for the sum of $1.00 as a site for its new Community Centre. In return, the Agricultural Society was granted the use of the grounds including the new building for eight days each year. Throughout the history of the fair, many events have been featured: the Saugeen Valley Steeplechase, a Fleece Wool Show, a Regional Sheep Show, a Jersey Parish Show, 4-H Calf and Swine Clubs, Pet Shows, Beauty Pageant, Skipping contests, Cream and Butter Commercial Features, Goat Show, Saddle, Heavy and Light Horses, Jr. Calf Club, and 4-H Horse Club, just to name a few, as well as the usual field crop, livestock, and homecraft divisions. The Society has had many volunteers throughout its history. From 1917 - 1918 the Durham Agricultural Society was honoured to have William Scarf elected as President of the Ontario Association of Agricultural Societies. In 1954, Anna Koehler served as President of the Homecraft section of the Ontario Association of Agricultural Societies. Jack Milligan was OAAS District 10 Agricultural director from 1998 - 2000. In the early years, the local schools closed for the fair and the Furniture Factory also closed for half a day. At the 100th anniversary of the Fair, centennial gates were erected by the Durham Agricultural Society and placed at the entrance to the Community Centre. The gates serve to remind us of the dedication and foresight of former Presidents and Directors. A Provincial grant of $1,000.00 was received for this purpose. The unveiling and dedication service was held in conjunction with the 1958 Fall Fair. Over the years, the Fair has seen many changes and challenges. In 1995 an "Evening Out" was introduced featuring a delicious roast beef dinner and entertainment by the Paul Brothers and Shirley. This event was established in order to raise funds for the Society and with its success it has become an annual event held in May of each year at the Community Centre. This is a function that many people look forward to. It also serves for the unveiling of the beautiful homemade quilt that to be raffled in the Annual Quilt Draw for the Fall Fair weekend. Each year, as we celebrate another Fall Fair and another anniversary of the Durham Agricultural Society, we look back with pride and gratitude to all those who served the Society diligently. It is from their dedication that our Society today is healthy and active. We are looking forward to seeing everyone at the Fair! Welcome to the 160th Durham Agricultural Society Fall Fair. We, the Board of Dlreciors would like to thank our communlty and volunteers for all their help over the past year putting together what we hope you will remember as the best Fall Fair ever. We also hope you wlll enioy each and every day of our 2018 ‘Treactors and Taligates' Durham Fall Fair and all the many different shows and events we have waiting for you, where you will have tons of fun with all of your family and friends. We, your Durham Agricultural Society. also know that none of the shows or events we have planned for you would ba possible without the continued very generous support of all our many sponsors and the many exhibitors we attract from Durham and the surrounding community. Thank you. 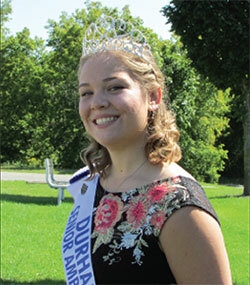 Without your participation and help there would be no Durham Fall Fair. This year or any year since 1858! Only by working together have, our sponsors, volunteers, members/exhibitors and Board of Directors kept our Durham Fall Fair a vibrant part of our community for 180 years! With your help our Durham Fall Fair has baan slowly growing for many years now, and we look forward to continuing to do so into the future. So ba sure to make plans this year to coma on down to the fairgrounds, have fun and enjoy all three days at tha Fair!!! In my lifetime I have only lived in Durham. I love the simplicity of it and its small town feel. I do not wish to live in bigger places like Toronto or London because I feel like they miss out on some great opportunities that are available in a small town like Durham. I know the area well and I know that if I were to go downtown I would see a familiar face and I would be able to stop, smile and my day would be improved. I am 18 years old and I could only tell you a few things about agriculture. I know that there is a process called genetic engineering where they crossbreed plants to get the best outcome but instead of boring you with a speech on that I decided to tell you a story and it starts on a very hot summer day. Being the smart person I am, I agreed to help hay with my Uncle Jeff, cousin Maddie and Grandpa. Load after load Maddie and I only got more tired while Grandpa only got faster. After a hard day of trying to play keep up, me and Maddie sat on a supporting beam in the barn trying to catch our breath. I remember thinking how lucky my other cousins were that they didn't get roped into helping. The main thing I can recall from that day is my Grandpa saying how someone should take a picture of Maddie and I, and show it at our weddings, because it would show that we weren‘t just another pair of pretty faces. That is one of my favourite memories because in that day we all worked together and got the job done quick. That moment in time I will cherish forever because it was a moment we spent together as a family. Moments in time make memories that last forever. Some of my fondest memories were created at the Durham Fall Fair. It started with the drawing contest in elementary school, playing arcade games with friends at the Fun Factory, marching around cows with oversized shoes, and watching the pretty floats go by in the parade. I have only participated in a few events myself but the Durham Fall Fair has even more to offer. There‘s horse competitions, sheep shows, music, displays, and the chance to taste a pie made by local members ofthe community. That's why the Durham Fall Fair is something very special to me and should be to everyone. 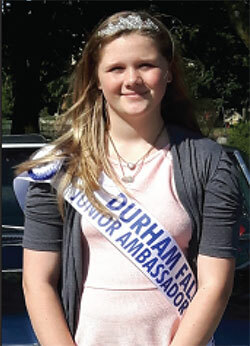 Hello, my name is Victoria Jarvis and I am the Durham Agricultural Society 2017-2018 Jr Ambassador. I turned 13 this past January and am entering Grade 8 in the fall. I live North of Durham with my parents Kristy and Victor Jarvis, along with my older brother Christopher and younger sister Lilian. My favourite sport is soccer. I have been playing for the West Grey Soccer Club since I was 4. I enjoy writing and reading short stories. Some day I hope to become an authour along with being a professional soccer player. This past year as the Durham Jr. Ambassador has been a wonderful experience. I have learned so much about Durham, our entire community and myself. I have had a lot of fun being the Jr Ambassador. I have made new friends, participated in some fun events, shared stories and learned many interesting things. Thank you for this great experience representing our community. Thanks to Natalie and Kat for making my experience more relaxing and enjoyable.